Any store, shop, office or business demands a good promotion to lure more customers that can make the profit to the company. People follow many ways of marketing strategies to develop words about their products & services. Bright LED signage work as a shimmering option for grabbing the temptation of the customers who are either searching for your shop or crossing by your area. There are groups of Sign Board Manufacturers in Chennai like Hi-Tech Vision who will produce all kinds of Sign Boards for their buyers. They create both interior & exterior signboards with metal, wood, LEDs, Neon materials & many more. They advise the clients which metal will suit the company based upon the buyer's requirements, also the signage which is being made by the Signboard producers. Name Board Makers in Chennai provides signages which can be fixed on the wall, door glass and even on the plywood. Signages are built with many materials like metal so it is described as metal signboards. Most of the Metal Letters Chennai are created with several metals like aluminum & brass. Few companies use lit up metal signboards by setting the LEDs on the signboards. 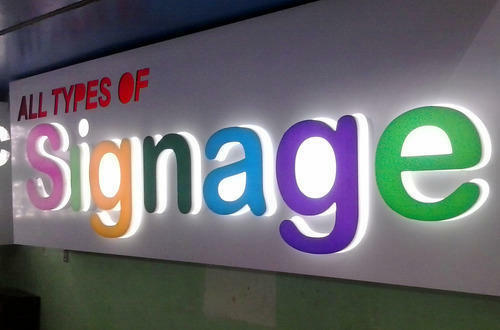 Maximum of 3D signages are located outdoor as they give a majestic look to the company. This can be seen at large companies, restaurants, Cinema theatres, function malls, Shopping malls, etc. LED Sign Boards in Chennai will consume less power and they give a longer life when matched to the fluorescent bulbs. They are also cost efficient & gives a attractive look to the firm as well. They are fit for all weather conditions. They can be placed in both the interior & the exterior places in and around the company. ← How Signboards target public and customers in an effective way?